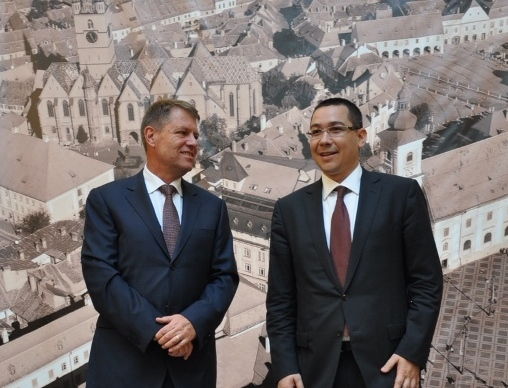 Iohannis, 55, head of the Liberals and mayor of the medieval city of Sibiu, or Hermannstadt in German, was nominated by Romania’s centre-right opposition on 11 August as candidate for president, pitting him against Ponta, who announced his candidacy in July. The city which Ioahannis has been leading since 2000 was established by German settlers in the 12th century and was Europe’s Capital of Culture in 2007. The Parliament’s two largest opposition groups, the Liberals (PNL) and the Democrat Liberals (PDL), voted unanimously to merge last month, hoping to boost their chances for the presidential elections against the incumbent Prime Minister and leader of the Romanian Socialist Party (PSD). The last presidential election was held in 2009 and Traian B?sescu was sworn in for his second term on 21 December 2009. He is ineligible for a third term according to the Constitution. Ponta, 41, came to power in May 2012 in an alliance with the Liberal Party, toppling a centre-right government that undertook painful wage cuts and tax hikes at the height of the financial crisis. PSD’s relations with the PNL liberals have since soured, but Ponta retained his parliamentary majority through an alliance with two smaller forces, the National Union for Progress of Romania (UNPR) and the Conservative Party (PC). According to a poll by the agency CSCI quoted by the website RomaniaTV.net, Ponta would obtain 46% at the first round of elections to be held on 2 November, against 24% for Iohannis, with the difference between the two narrowing at the 16 November runoff. According to CSCI, Ponta would obtain 58% at the runoff, against 42% for Iohannis. But some commentators said the result could be tighter than that. Some analysts quoted by Reuters say Iohannis’ German background might serve him well in dealing with the West. He is a supporter of economic reform, backed by international lenders, under a European Union umbrella. Ponta launched his campaign with the promise that he would spearhead changes to the constitution, which would make more clear the duties of the President, the government, the parliament and the local authorities. The next president will play a pivotal role in appointing a new prime minister and a government lineup to oversee International Monetary Fund-backed reforms under a €4 billion standby deal – with the loan deal review now being postponed pending the election. Iohannis has already clashed with Ponta following statements by the incumbent prime minister that he has brought the issue of religion to the electoral debate. The vast majority of Romanians are Christian Orthodox as Ponta, while Iohannis is Protestant. Commenting on a poll, according to which 58.22% of the respondents said for them the religion of the President mattered, while 39,81% said there were indifferent to the issue, Ponta said he did not believe that a candidate for President “has a problem if he is Orthodox or is not of Romanian ethnicity”. Iohannis has reacted strongly to the statement by his rival, saying that bringing the issue of religion is a “painful attempt” to poison the campaign. “Romania is a secular state. The Constitution says that we have equal rights regardless of religion or denomination. In Europe, there have been wars on this. It’s a shame that now some young politicians have not read these things,” said Iohannis, as quoted by the Romania press. Mediafax, Romania: Consiliul Na?ional al PSD. Ponta: Mi-am lansat candidatura la Novaci, Benge?ti, al?turi de oameni ce reprezint? România adev?rat? Nah, slim chances to become president because of his tenebrous relations with Basescu Traian and Angela Merkel, of being involved with child trafficking mafia back in the ’90’s. Not to mention the suspicions of fraud and money laundering related with all his 6 houses bought from a very modest high school professor salary. Yes, Basescu and Merkel are Mafia Dons. LOL. Merkel in the other hand, is “the ‘rock in romanian shoe”. To make clear this is not Victor Ponta but rather another Victor, that thinks that Romania will be seeing again the age of a new totalitarium regime come to power once the “gloata romaneasca” is about to vote Victor Ponta as their new president.